As you walk along the path by Wymeswold Memorial Hall to London Lane you are passing by land that has belonged to Wymeswold Charities since about 1640 and can be used by the Feoffees (or Trustees) for village purposes. The proposed extension of the Hall and the bowling green and re-arrangement of the childrens' play ground and allotments involves this land. How did it come to belong to the village? According to deeds copied by hand into various books (in Leicestershire Record Office, Nottingham University Library as well as Wymeswold Parish Church) this land, known as Widows' Close, was once called Ballard's Gift because the money that bought it was given to the village by the will of Daniel Ballard written in 1640. He was born in Wymeswold and baptised on 15 September 1579. His death is not recorded in Wymeswold Registers so we must assume that he died elsewhere. In a later deed he is described as of St Clement Danes in Middlesex and in his will as a citizen (of London?) and clothier or draper. He came from a family who were Lords of the Manor of Wymeswold from about 1540 until 1632 and as such held land in the parish. Daniel's will gave � to the Vicar and Churchwardens to be "lent out by them on good security for three years to five poor cottagers' widows by even and equal portions." In the event of there not being so many widows the interest of the money was to be lent to five poor cottagers. At the end of the three year period the money was to be lent to five other widows for three years. And so on for ever. Daniel Ballard also by his will required those benefitting by these loans to "give a little Bible to five such poor children of Wymeswold who by the judgement of the Vicar and Churchwardens shall by their reading best deserve the same." 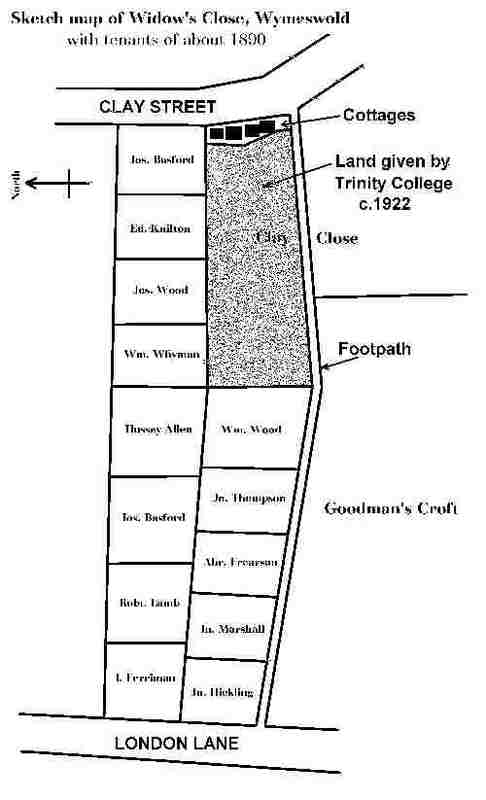 "Blind Joseph Basford told the writer of the book that a little piece of garden that used to go with his house, lying at the Clay Street end of the close, was thrown into the close so making his allotment a little larger than the other twelve allotments." A map held by Trinity College, dated 1885, shows them owning the land where the childrens' playground, bowling green and hall now stand. This was part of Clay Close and was given to the parish about 1922, when the Memorial Hall was being built. Two tennis courts were erected west of the Hall and these were replaced in 1937 by the bowling green and childrens' playground. The 25-inch Ordnance Survey Map of c.1885 shows a row of small cottages approximately where the Memorial Hall now stands. Widows' Close, then, was let out to 13 tenants in plots of 1/2 rood each (about 600 square yards or 500 square metres) and a list of the tenants names is given. Several well known family names occur in this list:- Joseph Basford (one-time sawyer; at that time there were two Joseph Basfords in the village); Edward Knifton (framework knitter); Joseph Wood (baker); William Whyman (blacksmith); Hussey Allen (the Vicar's gardener); John Basford (timber dealer); Robert Lamb; I. Ferriman; John Hickling; John Marshall; Abraham Frearson (agricutural labourer); Joseph Thompson (agricultural labourer) and William Wood. It has not been possible to discover the occupations of all these people with certainty. They each had about 1/2 rood for which they paid 10 shillings a year. This area has been used as allotments ever since. Originally published in the WHO Newsletter 1998.